Libraries gather added folders that are stored in different locations so you can browse them in one place. This tutorial will show you how to hide or show Libraries in the navigation pane of File Explorer for only your account in Windows 10. If you turn on Show all folders in the navigation pane, Libraries will always show in the navigation pane. A) Click/tap on Show libraries to check it. A) Click/tap on Show libraries to uncheck it. 1. Open File Explorer Options. A) Check Show libraries, and click/tap on OK.
A) Uncheck Show libraries, and click/tap on OK. The downloadable .reg files below will modify the DWORD in the registry key below. 1. Do step 2 or step 3 below for what you would like to do. A) Click/tap on the Download button below to download the file below, and go to step 4 below. 4. Save the .reg file to your desktop. 5. Double click/tap on the downloaded .reg file to merge it. 6. If prompted, click/tap on Run, Yes (UAC), Yes, and OK to approve the merge. 7. If you like, you can delete the downloaded .reg file if you like. 8. If open, close and reopen File Explorer to apply. How can we remove Libraries from the navigation pane when 'Show All Folders' is selected? Only by turning off "Show all folders" to affect only your account. Otherwise, you could use OPTION FOUR below to do so, but it'll affect all users. That would do so for all users instead of just your account. Ah, brilliant. Adding the Recycle Bin to 'not showing all folders' view means less registry editing for me. Would there be a way to stop folders from automatically being added to Quick Access? 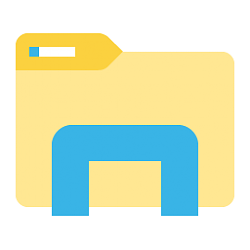 #I only really want to see Folders I pin to Quick Access, and the Recent Files I've used. Libraries activation box has been moved in 10240.